Once, every farm in Norway was required by law to brew its own ale. All of that ale had a natural smoky taste because the malt was kilned by fire, and most of it was spiced with juniper berries. Norwegian Wood, a recreation of that traditional style, is made by the "Hand Brewery" - four guys brewing in their spare time, on an absurdly small scale. Beautiful aroma of smoke, wood, malt and spices from the very lively pour. Norwegian Wood pours a dense muddy brown with a creamy beige head. Moderately sweet intake with roasted malt, caramel, smoke and juniper berries. 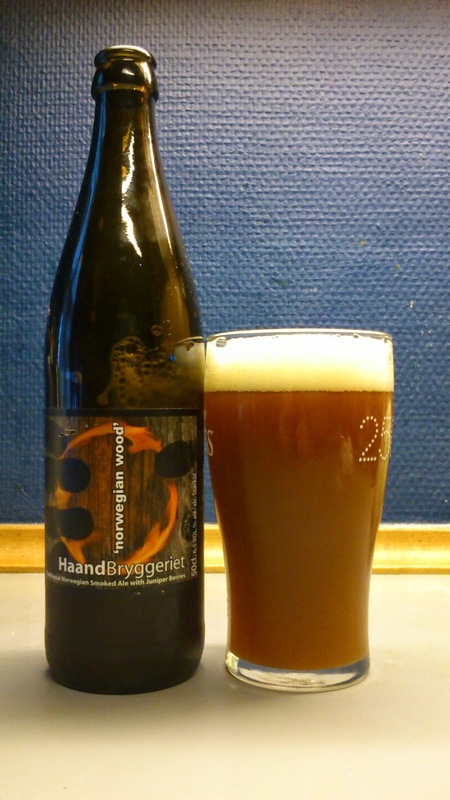 The finish is mild hoppy bitter and has a woody dryness. It has a pleasant sweet aftertaste with smoke, caramel and juniper. Quite fizzy and slightly oily mouthfeel. Not the best looking beer but a very tasty smoked ale and I really enjoyed drinking this one. A lot lighter than I expected. If buying, be careful on the pour or you will end up with a lot of sediment floating about. No problem for me buying and drinking another. One gripe, I thought the carbonation was too high. Summing up, a light and tasty smoked ale which left me very impressed. This scored perhaps a bit low 7.5/10 on the 'I still have not forgiven them for AHA' Beerometer.